Who invented Nail Polish? Historians tend to agree that Nail Polish was invented c. 3000 BC and the first known use of Nail Polish was during the Neolithic China period of invention (c. 3000 - c. 1900 BC) although the Ancient Egyptians and the Mesopotamians were also known to have worn nail polish about the same time. Why was Nail Polish first applied? The practice of wearing nail polish was to protect and preserve nails, which were seen in ancient civilizations as a status symbol and as an indication of wealth. Nail polish was also used as a cosmetic to improve and enhance the appearance of nails. Definition of Nail Polish: Nail Polish is defined as a quick-drying cosmetic lacquer or polish that is applied to the nails to color them or make them shiny. The care of nails is referred to as manicuring. Fact 1: Who invented Nail Polish? The name of the inventor of Nail Polish is unknown but it is believed to have been invented c. 3000 BC during the Neolithic China era of inventions (c. 3000 – c. 1900 BC). Fact 2: Who invented Nail Polish? The invention of Nail Polish emerged when long nails were considered to be a status symbol and an indicator of wealth. 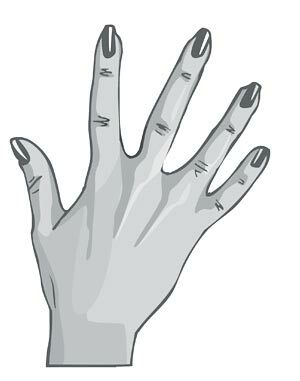 People who worked as manual laborers or who were constantly involved in light tasks were not able to keep their nails long - they broke off far too easily. Fact 3: Who invented Nail Polish? Anyone with long nails clearly did not have to work for a living, so long, well cared for nails became a much envied status symbol. Fact 4: Who invented Nail Polish? The Ancient Chinese began wearing Nail Polish as a cosmetic c. 3000 BC and used a mixture of different ingredients to create a suitable polish and colorings for nails. Fact 5: Who invented Nail Polish? At first nail polish was used as a cosmetic by varying social classes but c.600BC it began to be used to denote social status and only Emperors and privileged members of the Chinese royal family were only allowed to use Black and Red colors to represent boldness and strength, everyone else was allowed to wear lighter shades. Fact 6: Who invented Nail Polish? Black nail varnish, especially, was extremely difficult, time consuming and expensive to produce. Various plants, fruits and flowers were used as colorants. The South China Rhododendron, indigo and ebony fruit provide natural dyes for black coloring. Other colors were derived from the petals of Orchids, Sumac, the Rose and Impatiens flowers. Fact 7: Who invented Nail Polish? The formula to create Chinese Nail Polish include various ingredients such as the acacia gum (Gum Arabic), gelatin, beeswax and egg whites. Fact 8: Who invented Nail Polish? Acacia gum (Gum Arabic) functioned as a binder, to increase luminosity and helped to prevent colors from lightening. Gelatin, a thin translucent membrane, was included in the formula to thin pigments and produce different color effects. Egg whites were used to provide shine and firmness. Beeswax was added to the formula to strengthen nails and to forestall splitting and cracking. The bark of the Pomegranate tree was also used to make nail polish because it contained high amounts of tannin for color fastness. Fact 9: Who invented Nail Polish? With the elevation of wearing nail polish c.600BC, the Ancient Chinese of the Shang dynasty invented false nails, or guards, to emphasize the social standing and status of the Chinese Empress, female royalty, noblewomen and concubines. The Chinese false nails, up to 5 inches long, were extremely expensive and made of gold and silver and inlaid with gemstones to create various designs. Fact 10: Who invented Nail Polish? Other ancient civilizations including the Mesopotamians and the Ancient Egyptians also wore nail polish during the same time period. Fact 11: Who invented Nail Polish? The Ancient Egyptians used a form of henna to paint their nails also as an indication of social status. Henna was a dye obtained from the leaves and shoots of the henna shrub which was readily available in Egypt. The dried and ground henna leaves were worked into a paste with water on a special palette to make nail polish. Fact 12: Who invented Nail Polish? Henna was used to stain the fingers and toes of Pharaohs and great nobles prior to mummification and traces of Ancient Egyptian nail polish has been found on the nails of mummified pharaohs. The statues of Ancient Egyptian gods and goddesses were adorned with all different types of Makeup and cosmetics, including nail polish. Fact 13: Who invented Nail Polish? Tombs of ancient Babylonians of Mesopotamia have been found to contain solid gold manicure tools together with evidence that kohl was used to create the black nail polish. Fact 14: Who invented Nail Polish? The practice of painting nails was also adopted by the Ancient Greeks and the Romans but was abandoned by the later civilizations who lived during the Dark Ages and the early Middle Ages when the wearing of cosmetics and nail polish was deemed to be immoral. Fact 15: Who invented Nail Polish? The practice of painting nails in various colors completely disappeared but women in the 19th century did shine their nails with a cloth and oil and some even used tinted powders and creams on their nails, before buffing them to create a shiny look. Fact 16: Who invented Nail Polish? The 1920's heralded the Roaring Twenties and the era of the free spirited 'Flappers' who shocked society by wearing mascara, lipstick, face powder, rouge and nail polish. Fact 17: Who invented Nail Polish? The commercialization of the product began when the automobile was invented and enamels were used to paint cars. The new enamels of the 1920's inspired French makeup artist Michelle Menard who was working with the Charles Revson company to create an enamel paint that could be applied to fingernails. Fact 18: Who invented Nail Polish? The Charles Revson company changed its name to Revlon and started selling the first commercial nail polish in 1932. Fact 19: Who invented Nail Polish? Movie Stars took to wearing the product and the 1939 movie 'The Women' features wealthy women visiting an exclusive beauty salon that was selling a new color called 'Jungle Red'. Fact 20: Who invented Nail Polish? Much as women liked to emulate Hollywood Movie stars this was not possible when WW2 erupted (1939 - 1945) when everything was rationed. This was not the time to wear makeup, nail polish and cosmetics went out of fashion, except for powder and lipstick until the liberating period of the 1960's when the conservative attitudes of previous decades were abandoned and independent women in the Swinging Sixties once again turned to the use of cosmetics and Pop Art influenced the fantastic range of colorings for nails. Fact 21: Who invented Nail Polish? In the 70’s, the American Jeff Pink founded the Orly company and, using acrylics, created a special manicure with the tips in pristine white called the 'French manicure'. Who Invented Nail Polish? - Unknown Inventor - Invention - Definition - Meaning - Famous - Device - Innovation - Significant - Development - Recreation - First - Definition - Kids - Facts - Information - Info - Who invented Nail Polish - Dates - When - Why - Impact - Purpose - Use - New - Old - Definition - Meaning - Awesome - Cool - Neolithic China (c. 3000 – c. 1900 BC) - Ancient China - Who invented Nail Polish? - Nail Polish History - Nail Polish Timeline - Who Invented Nail Polish?